Many of the paintings made at court served political purposes. Emperors liked to see paintings that testified to the effectiveness of their rule, signs that the people were prosperous and happy, or that Heaven had responded to their virtue by sending auspicious omens. Another favored topic was stories of noble or exemplary individuals, especially ones that had messages for rulers. Emperors also commissioned illustrations of the classics, which confirmed their support of learning. All of these uses of painting were especially prominent during the reign of the first emperor of the Southern Song, Gaozong, who had to convince the literati that even though they had not been able to push back the Jurchen and retake the ancient homeland of China, they were the legitimate government, the protector of ancient traditions. The scene below is the central section of a large hanging scroll illustrating the story of a loyal minister of the Han dynasty. At a court audience Zhu Yun inappropriately asked for the emperor's sword. Outraged, the emperor sentenced Zhu to death, but when his guards tried to drag Zhu away, he protested vehemently, grabbing onto the balustrade, and insisting that he be put to death immediately. One minister did not object, but another intervened to defend Qu's character and admonish the emperor. Can you pick out the honest minister in this picture? 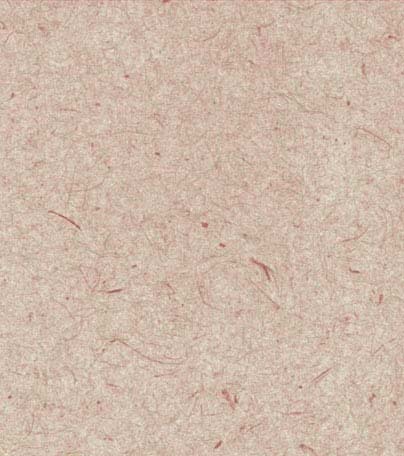 Why would an emperor like Gaozong have wanted a painting like this to be produced at his court? The artist of this painting, Ma Hezhi, was a court painter under Gaozong who illustrated many classical texts. 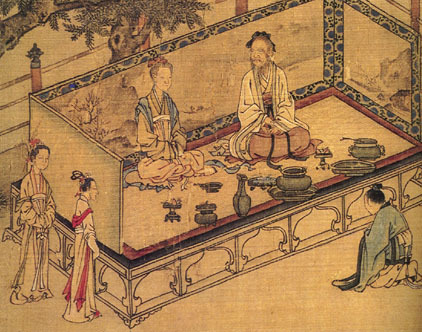 Here is one scene from his illustrations to the Classic of Filial Piety. Note the landscape painted on the screen. Who do you think each of the people in this scene represent? Why aren't the older couple sitting on chairs? Depictions of peace and prosperity also served the political needs of the court. 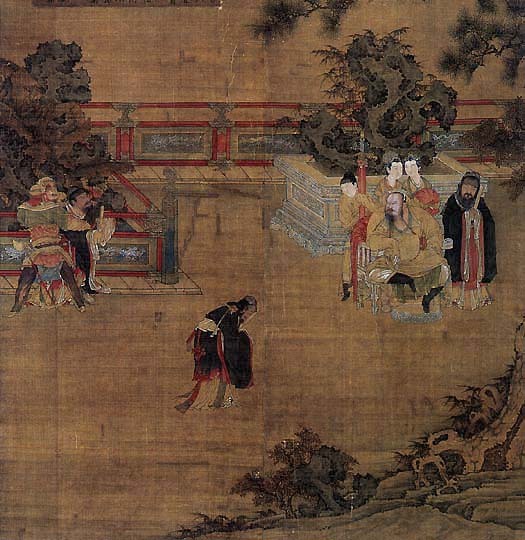 Paintings like Zhang Zeduan's The Spring Festival Along the River or Li Song's Knickknack Peddlar could be read by emperors as evidence of the success or their governments. So too could depictions of busily engaged farmers, like the one below. 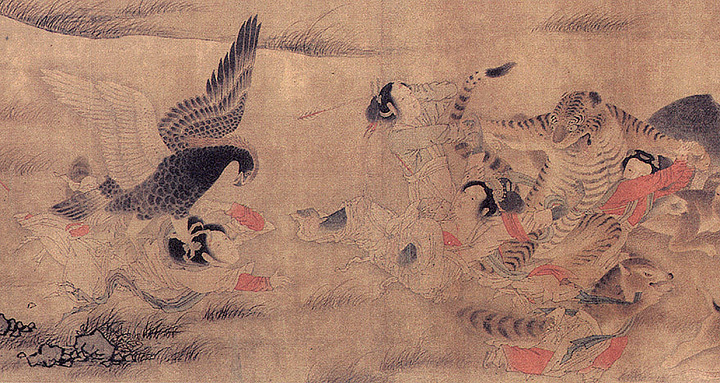 The Yuan court did not commission as many narrative paintings as the Southern Song court had, but the painting below may have appealed to the Mongol rulers not just for its story, but also for its depiction of animal combat.